Editorial- Christodoulou Ir. Thanks God. Swine Flu is not surgical disease. 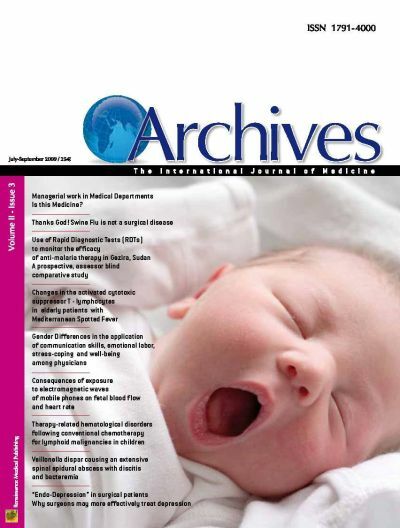 Archives Inter J Medicine 2009;2(3):256. Original Article- Nour B, Schallig H, Mens P, Saeed O, Mohamadani A. Use of rapid tests to monitor the efficacy of antimalaria therapy in Gezira, Sudan. Archives Inter J Medicine 2009;2(3):257-262. Original Article- Gospodinova M, Nenova M, Mileva M. Changes in the activated cytotoxic suppressor T-lymphocytes in elderly patients with mediterranean spotted fever. Archives Inter J Medicine 2009;2(3):263-268. Case Series Article- Spasova MI , Stoyanova AA, Moumdjiev N.Therapy related hematological disorder following covnentional chemotherapy for lymphoid malignancies in children.Archives Inter J Medicine 2009;2(3):269-272. Original Article- Lovell B, Lee RT, Brotheridge CM. Gender differences in the application of communication skills, emotional labor, stress coping and well being among physicians.Archives Inter J Medicine 2009;2(3):263-278. Original Article- Farid A, Azmy O, Taha T, Bidars M, Abbassy A. Consequences of exposure to electromagnetic waves on fetal blood flow and heart rate.Archives Inter J Medicine 2009;2(3):279-281. Case Report - Lavender TW, Doshi ND, Subudhi CPK. Veillonella dispar causing an extensive spinal epidural abscess with discitis and bacteremia.Archives Inter J Medicine 2009;2(3):282-285. Original Article- Christodoulou Irene. "Endo -Depression" in surgical patients . Why surgeons may more effectively treat depression.Archives Inter J Medicine 2009;2(3):286-289.